Pack size: 1 x 7.5ml bottle. Great eye drops Really pleased with these eye drops! I suffer from quite bad dry eyes, especially when wearing my contact lenses and these eye drops really work! Review Hycosan Extra Eye Drops I need to use this product several times daily and find it comfortable and effective but feel the actual dispenser could be more user friendly. Dry eyes can be a horrible condition for contact lens wearers, and specialist eye drops may be needed in troublesome cases - This is where Hycosan Extra Eye Drops come in. Formulated to be more viscous than normal eye drops, they are a powerful means of ensuring that eyes are moist and that contact lens wearing is as comfortable as possible. Crafted by Scope Healthcare to be twice as strong as their normal varieties. • Formulated without the use of any preservatives, which means that irritation is far less likely for sensitive eyes, the Hycosan Extra Eye Drops are still extremely powerful. 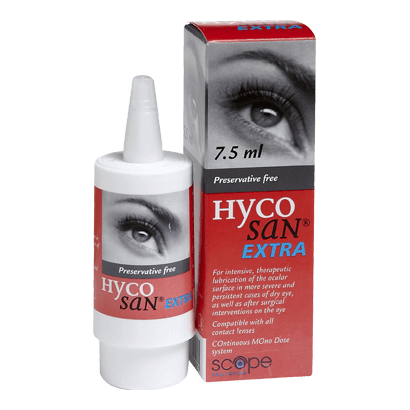 • Scope Healthcare suggests administering the Hycosan Extra Eye Drops three times per day in each eye. Using the drops is made even easier by the firm's patented Comod delivery system, which ensures that each drop can be delivered at the click of a button and in equal dosages. • Hycosan Extra Eye Drops are suitable for use with all types of contact lenses. • Each batch of the eye drops will last for five weeks with normal usage. After opening, Hycosan will still be effective up to a period of six months. • Includes the active ingredient Sodium Hyaluronate to moisturise eyes effectively. When you really need extra moisture to keep contact lenses comfortable and effective, it is hard to beat Hycosan Extra Eye Drops. Powerful, easy to use and gentle too, these drops are a great solution to dry eye issues.